1. Two point charges, QA = +8 μC and QB = -5 μC, are separated by a distance r = 10 cm. What is the magnitude of the electric force. The constant k = 8.988 x 109 Nm2C−2 = 9 x 109 Nm2C−2. 2. Two charged particles as shown in figure below. 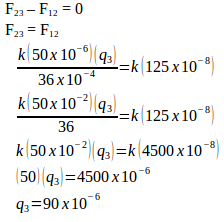 QP = +10 μC and Qq = +20 μC are separated by a distance r = 10 cm. What is the magnitude of the electrostatic force. 3. Three charged particles are arranged in a line as shown in figure below. Charge A = -5 μC, charge B = +10 μC and charge C = -12 μC. Calculate the net electrostatic force on particle B due to the other two charges. The net force on particle B is the vector sum of the force FBA exerted on particle B by particle A and the force FBC exerted on particle B by particle C.
The direction of the electrostatic force points to particle A (point to left). The direction of the electrostatic force points to particle C (point to right). FB = FAB – FBC = 675 N – 125 N = 550 Newton. The direction of the net electrostatic force on particle B points to particle C (points to the right). 4. +Q1 = 10 μC, +Q2 = 50 μC and Q3 are separated as shown in the figure below. What is the electrostatic charge on particle 3 if the net electrostatic force on particle 2 is zero. The net force on particle 2 is the vector sum of the force F21 exerted on particle 2 by particle 1 and the force F23 exerted on particle 2 by particle 3. The direction of the electrostatic force points to particle 3 (point to right). The direction of the electrostatic force points to particle 1 (point to left).